Richmond GMO Protest. Photo by Lorin Droppa. In the last two years, I have noticed and become part of a trend that I hope will continue. The trend is that our community of existential-humanistic psychologists has begun to move toward social activism. We have seen the power of publically taking positions for and against psychologically relevant issues. The most well-known of these positions has been the Open Letter to the DSM-5, which seemed to spark an American flame to what was already an international concern—a concern about the increased medicalization and use of prescriptions for psychological maladjustments that were being determined by a small group of psychiatrists. I was impressed by how many people—graduate students, professors, therapeutic professionals, and mental health workers—rallied to be part of this Letter, and ultimately, this movement. On the Society for Humanistic Psychology’s Facebook Page, people openly claimed to be proud of the society’s stance and rejoiced about feeling part of something bigger—some for the first time in a long time and some the first time ever. Due to the high profile position that SHP played in the Open Letter, there was not only a slew of media attention but also calls for our Division to join in other Social Activism issues. Each of these presented concerns that I think we have to think seriously about in our future endeavors—because I think we should continue to be involved in these sorts of issues. The media attention seemed to be centered on the Open Letter Committee and rightfully so. The good news was that with a small number of spokespersons, the message remained clear and consistent. The downside to having small numbers in charge of the message was this seemed to restrict the amount of people who wanted to be part of the energy and the movement. The second issue is how do we concentrate our limited energies on specific concerns and how do we decide what to not support. These are extremely difficult questions especially for a relatively small group of individuals who are spread around the country but have a variety of empathic concerns. Interlude: Recently, in my History of Psychology class, I have been talking about finding your calling and specifically, how you might know that there is something that matters to you. I have been suggesting that “authentic moments” are not something that you generally enjoy. People like to say, “I’m authentic” with a sort of pride (and superiority that makes you wonder if they understand the meaning of the word). I emphasized to my class that the authentic moment is more likely to make you sick to your stomach (nauseated) rather than proud. The authentic opportunity also is more likely to make you anxious and make you question your courage. You are probably going to want to avoid the opportunity rather than jump in with both feet. It is likely that if you do proceed forth, though, later down the road you will proud of yourself. What calls you is the instantaneous feeling of injustice about the situation; you know something is wrong and that it shouldn’t be this way. This is the existential call: you either stand up or you avoid it. Attempts to avoid this call will haunt your conscience; listening to your conscience will test your nerves and the status quo of your life-world. Personal story: Over the years, this Psych History class has been slowly transforming into a course aimed at helping students find their plan for the “good life.” Since we know that teaching helps the teacher be a better student, I have been trying to “put my money where my mouth is.” This last semester, I had been relating to the class my concerns about Genetically Modified Organisms and the fact that they have been linked to serious illness, and yet, foods containing GMOs are not labeled in grocery stores. We were covering Nel Noddings (1984) in our class at the time that the so-called “Monsanto Protection Act” was passed. Noddings suggests that we “care for” some one thing, rather intellectually “caring about” a bunch of things that we do nothing about. If you don’t know, the Monsanto Protection Act says that if it is found that GMOs cause people to be seriously ill, they can’t sue Monsanto for damages. Also, traditionally when a food product’s safety is questioned, the company has to stop producing it until it is determined to be safe. The Monsanto Protection Act states that Monsanto can continue to produce and sell its products regardless of the accusations against them. So what? Here’s where I got myself into an existential moment. I told my class that Nel Noddings had convinced me to be part of the March Against Monsanto. 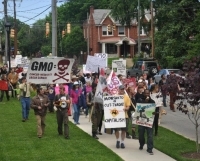 A number of organizers around the world decided to respond to the Monsanto Protection Act and to protest this Act that basically puts Monsanto “above the law.” They had set up organizers in major cities across the United States, and there was one set up in Richmond, VA, where I live. And so, I told my class I would join the March—my first protest in 20 years. I think somewhere in my bravado I may even have said that I thought all Americans should attend one protest during their lives. I reiterated that Noddings is saying that we should all adopt one “lost” cause. What happened next, made me sick to my stomach. About four weeks before the march was to occur, the organizer of our local event dropped out. There would be no march in Richmond. In a sense, I was off the hook. I didn’t have to do this and it wasn’t my fault—what a shame, though. But I did not feel relieved. Instead, I think I felt what Heidegger (1926/1962) termed the “call of conscience” and Sartre termed “nausea.” “I” had to do something. This event was too important to let die. But I didn’t want to be responsible for it—I just wanted to march in it. I waited a week to see if someone would pick up the ball. No one did. To make the story short, I contacted a local activist. Together, we formed a committee. The committee of strangers pulled together enough to make the march happen. We got about 350 people to join us, and we marched in the grocery district of Richmond. The event didn’t make the newspaper and only one TV station had a one-minute clip about the march. That doesn’t matter (that much)! Because we were a community standing up for what we think the public needs to know. Back to Psychology: I learned a lot by being part of that march that was both synchronicitous and serendipitous. But it reminds me that we existential and humanistic psychologists are being called—I believe right now—to be Activists. I don’t believe that at the heart of existentialism is individualism. I believe that you have to find your own path or open your self to find your own calling. But once you find that path, there will be fellow travelers. Should you really find that you are a sole beacon, do not worry! Light always attracts others. We always walk toward the light. You are now the source of the community. Existential Psychology is fundamentally about community building. How? I do think we have to organize better and more systematically. We have to pick our battles and not spread ourselves too thin. We have to trust others to spread our message and that means getting to know each other as best we can when we have opportunities to gather in person. We certainly have to take advantage of any technology that will put us more frequently in contact with each other. So, in the coming year, I would like us to think about how we can develop the infrastructure to support a growing interest in psychological, and more importantly—existential—activism.